AL REALIZAR EL PAGO POR PAYPAL, USTED ACEPTA QUE LOS DATOS ENVIADOS EN LA SOLICITUD DE ENCARGO PERSONALIZADO DE NUESTRA WEB SON CORRECTOS. DEBE REALIZAR EL PAGO COMPLETO DE TODAS LAS PARTIDAS QUE LE HEMOS INDICADO POR EMAIL, QUE CORRESPONDEN A TODOS LOS PROCESOS DE FABRICACIÓN DE LA AYUDA VISUAL PERSONALIZADA QUE HA ENCARGADO. UNA VEZ REALIZADO EL PAGO, PROCEDEREMOS A REALIZAR EL ENVIO POR COURRIER. EN EL EMAIL QUE NOS HA PROPORCIONADO RECIBIRÁ COPIA DEL COMPROBANTE DEL ENVÍO. UNA VEZ RECIBIDA LA AYUDA VISUAL EN LA DIRECCIÓN INDICADA POR USTED, RENUNCIA AL DERECHO DE CUALQUIER RECLAMACIÓN, DISPUTA O RECLAMACIÓN DE CARGO POR CUALQUIER ERROR EN LOS DATOS DEL FORMULARIO DE PEDIDO RELLENADO POR USTED O POR PROBLEMAS DE ADAPTACIÓN. 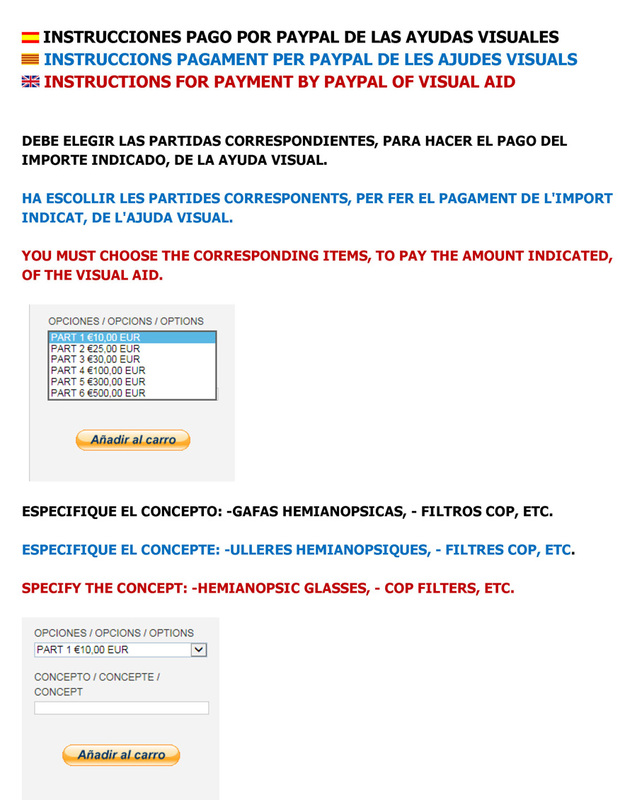 AL REALITZAR EL PAGAMENT PER PAYPAL, ACCEPTA QUE LES DADES ENVIADES A LA SOL·LICITUD D'ENCÀRREC PERSONALITZAT DE LA NOSTRA WEB SÓN CORRECTES. HA DE REALITZAR EL PAGAMENT COMPLET DE TOTES LES PARTIDES QUE LI HEM INDICAT PER EMAIL, QUE CORRESPONEN A TOTS ELS PROCESSOS DE FABRICACIÓ DE L'AJUDA VISUAL PERSONALITZADA QUE HA ENCARREGAT. UN COP FET EL PAGAMENT, FAREM L'ENVIAMENT PER COURRIER. AL EMAIL QUE ENS HA PROPORCIONAT REBRÀ CÒPIA DEL COMPROVANT DE L'ENVIAMENT. UN COP REBUDA L'AJUDA VISUAL A LA ADREÇA INDICADA PER VOSTÈ, RENÚNCIA AL DRET DE QUALSEVOL RECLAMACIÓ, DISPUTA O RECLAMACIÓ DE CÀRREC PER QUALSEVOL ERROR EN LES DADES DEL FORMULARI DE COMANDA EMPLENAT PER VOSTÈ O PER PROBLEMES D'ADAPTACIÓ. WHEN MAKING PAYMENT BY PAYPAL, YOU ACCEPT THAT THE INFORMATION SENT IN THE REQUEST OF PERSONALIZED ORDER OF OUR WEB IS CORRECT. YOU MUST MAKE THE COMPLETE PAYMENT OF ALL THE ITEMS THAT WE HAVE INDICATED YOU BY E-MAIL, THAT CORRESPOND TO ALL THE MANUFACTURING PROCESSES OF THE VISUAL PERSONALIZED AID THAT YOU ORDERED US. ONCE YOU MADE THE PAYMENT, WE WILL MAKE THE SHIPMENT BY COURIER. IN THE E-MAIL THAT YOU GIVE US, YOU WILL RECEIVE A COPY OF THE VOUCHER OF SHIPMENT. ONCE YOU RECEIVED THE VISUAL AID IN YOUR ADDRESS, YOU GIVE UP THE RIGHT OF ANY CLAIM, DISPUTE OR CLAIM OF CHARGE FOR ANY ERRORS IN THE INFORMATION OF THE ORDER FORM COMPLETED BY YOU OR ADAPTATION PROBLEMS.